This month, Connect Plus Services is observing a series of safety stand downs. It’s a time we remember industry colleagues who’ve been injured or killed in the course of their work. It’s a time we ask everyone to take a step back and really consider what we can do to improve safety for everyone that works for or with CPS, and those who may be affected by our works. 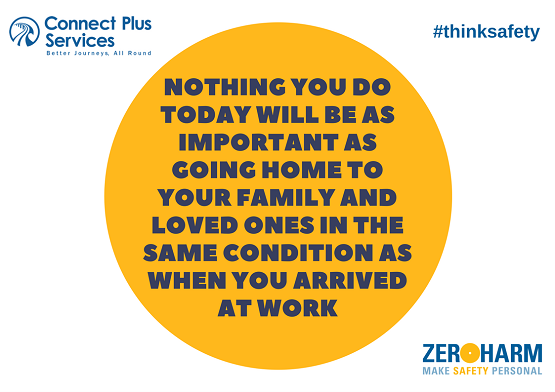 We believe there’s no reason that Zero Harm can not be achieved and that many of the injuries and near misses we have CAN be prevented. We have rules, equipment and processes that, when used and followed properly, manage the majority of risk out of our activities. For the next two weeks, we want everyone to take a moment to consider the area they’re working in, what they’re doing, and how they’re doing it. Entry submitted by Connect Plus Services.